In a blender, puree 1 cup yogurt, cherries and 1/4 cup agave. In a small bowl, stir together remaining 1/2 cup yogurt and 2 tablespoons of agave. Spoon cherry mixture into bottom of four plastic popscicle molds, top with vanilla mixture. Slide sticks in molds and freeze until firm, about 6-8 hours. In a microwave-safe bowl, melt together chocolate chips and coconut oil, microwaving in 30 second bursts, then stir until smooth. The mixture should not be hot. Remove popscicles from the freezer. 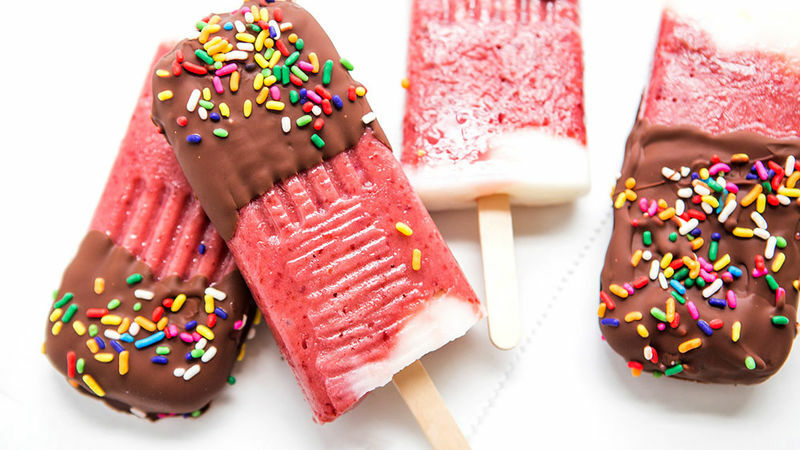 Working quickly, dip popscicles in chocolate mixture, sprinkle with rainbow jimmies. Return to baking sheet and freeze until ready to serve.